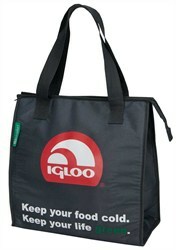 Igloo Products Corp., the nation’s largest cooler manufacturer, has introduced a new line of insulated grocery totes. The Igloo Market line features reusable, thermal insulated totes designed for trips to the grocery store or farmer’s market for the environmentally conscious consumer. We have always promoted the use of our soft-sided products as a ‘green’ alternative to plastic grocery bags, but with the new Igloo Market line we wanted to make products specifically designed for grocery shopping. The Igloo Market line consists of three products—the 56 Can Thermal Tote, the 56 Can Thermal Bag, and the 30 Can Grocery Tote—made partially of Recycled Polyethylene Terephthalate (RPET) in various colors and patterns. Polyethylene Terephthalate (PET) is a very common plastic used in a number of consumer products, most notably the plastic bottle. PET is the most widely recycled plastic in the world, and can be reprocessed into a variety of products, including fabric. According to Igloo soft-sides product manager Melissa Poole, consumers are searching for better alternatives to disposable plastic, and even paper, bags. “More than 85 US communities have banned or discouraged the use of plastic bags, including San Francisco, Austin, New York City, and Washington, D.C. Italy, China, India, France and many other countries around the world have also banned or taxed the use of plastic bags,” said Poole. “We have always promoted the use of our soft-sided products as a ‘green’ alternative to plastic grocery bags, but with the new Igloo Market line we wanted to make products specifically designed for grocery shopping,” continued Poole. Igloo Market is different from Igloo’s everyday use Trend items. “Igloo Market products are items that consumers will be using a couple times a week at most, not every day, so they are meant to last beyond just one year. Instead of using patterns and colors that are trending specifically for 2014, we looked to interior design for organic pattern inspiration and included gender-neutral solids. We wanted patterns and colors that the consumer will want to carry from year to year,” Poole explained. The Igloo Market 56 Can Thermal Tote, 56 Can Thermal Bag and 30 Can Grocery Tote are available in solid olive, graphite and navy, or patterns fuchsia/orange blossoms, teal/yellow stripes and blue organic dots. The 56 Can Thermal Tote and 56 Can Thermal Bags feature reflective thermal liners to transport frozen, chilled or hot food; easy-to-clean, leak-resistant, antimicrobial liners; a front zippered pocket and collapsible material for convenient storage. They are partially made from recycled plastic. The Igloo Market line will be available in early 2014 with retails ranging from $5.99 to $14.99. For further information about the Igloo Market line or about any other Igloo product, contact Katie Davis at KDavis(at)igloocorp(dot)com or visit the company’s Web site at http://www.igloocoolers.com.